For any shop that does a significant amount of embroidered emblems or patches, a laser cutter can incrementally speed up production. 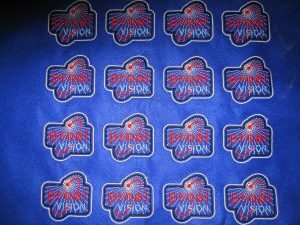 A laser is the fastest way to cut embroidered emblems after being sewn. Emblems can be ganged on a piece of fabric, and the laser is programmed to contour cut each one inside the hoop. There are three types of lasers that can be used to do this. For high volume, a laser bridge machine, which fits over a multi-head embroidery machine is ideal. Once the emblems are stitched, the laser head progresses down the line, cutting out the emblems inside each hoop. For medium production, a standalone galvanometric type laser can be positioned between laser embroidery machines. The hoop is removed from the embroidery machine and placed in the standalone laser, which quickly cuts out each emblem. The third option is to use a single-head embroidery laser machine, which cuts right in the hoop on the machine.